Placebo Junkies is a dark and intense book. I was gripped from the very first pages, and fell deep into the story. 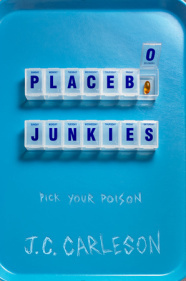 I found Placebo Junkies nearly impossible to put down. With all of my medical conditions, one would think that I would have stopped to consider the subjects of drug trials. I certainly take enough prescription medications to warrant the consideration. But, all I ever really thought about drug trial participants was that people with certain conditions signed up for trials relating to their specific problems and that was it. I never even thought about people who participate in medical research for money, in addition to or even in lieu of a traditional job. So, the premise of Placebo Junkies kind of blew my mind, but in a good way. In a way that made me see the world a little differently and think about things differently. And that is always huge when a book has that kind of effect on me. There were periods, sometimes just scenes, of lightness and happiness throughout Placebo Junkies. But mostly, this book was about its heavy subject matter: the danger of being a human test subject. And the story was so intense and thought-provoking. I was rooting for Audie's happiness and storybook ending throughout the whole story. So the actual ending came as a complete surprise; a twist I never saw coming. I admire J.C. Carleson for taking that risk and finishing Placebo Junkies in a manner that suited the feel of the book itself. Placebo Junkies was a great read. I would recommend it for the higher end of the YA spectrum, and for adults as well. The story stayed with me for weeks after finishing it, and as I type this review, I find myself hoping for a follow-up book. Wow, this book doesn't really sound like any YA I've read before! The premise reminds me a bit of one summer I spent as a research assistant in a neuropsych lab. Some of the participants I had in my study literally just booked themselves up each day with studies, hopping from psych lab to psych lab and getting paid for it (of course, most of them were students, but still, they didn't appear to have a typical summer job). Now, it was more 'fill out this questionnaire' and 'take this computer test' rather than anything like prescription drug trials, but still, it was a little strange to wrap my head around.